The Artists Journey by Nancy Hillis MD | Carpe Diem | Seize the day and say “yes” to your yearning to create your deepest art and life. I love this Latin aphorism from Horace’s Odes which translates to: “Seize the day, put very little trust in tomorrow”. Memento mori (remember you are mortal) is another phrase Horace used in relation to carpe diem to urge us to use the knowledge of our mortality to inform our realization of the importance of the present moment. For as long as I can remember, I’ve been a fan of thought experiments. A thought experiment, also known as Gedankenexperiment, explores possible hypotheses, principles or theories and thinks through its possible consequences. There are many examples of thought experiments throughout history: the Greeks used a thought experiment (deiknymi) as the most ancient pattern of mathematical proof, Galileo’s demonstration of falling objects and Plato’s allegory of the cave to name a few. A particularly powerful thought experiment is where you imagine yourself on the last day of your life, on your death bed. What will matter to you? Who will come up in your thoughts? What will you regret? Find joy in your life. It’s later than you think. For years, I put off writing this book, the book of my dreams. Quotidian demands tugged at my hair and magically expanded to fill up the available time and then some. Weeks dissolved into months and finally, years. One day, I woke up. The lines on my face betrayed the decades that had slipped away. When would I say yes to my yearning to write the book that lived inside of me? When would I answer the calling of my dreams? When would I finally stop refusing the call? When would I finally say “Yes”, decisively? A small, still, persistent voice inside of me kept asking: When are you going to write your book? As I asked myself these questions, I remembered the idea of the thought experiment. I knew from experience that I could examine what is meaningful to me by imagining being on my death bed. Here’s what appeared in the reaches of my imagination as I contemplated the death bed. As bright as the sun outside Plato’s cave, I had this realization: Dead women don’t write books. It’s now or never. There’s no time left to refuse. You must not turn your face away again. No more “waiting for Godot”. Now I ask you to consider your own existential thought experiment. Imagine smiling on your death bed. You’ve wrestled down your fears and self-doubt and created your deepest art and life. You don’t want to come to your final moments regretting un-lived dreams. You’ve got paintings inside you waiting to be expressed. You know that, while you could keep repeating what’s worked before in your art, this is a kind of soul death. You want to experiment, take risks and explore a deeper self expression. The worst thing you could do as an artist is resist experimentation. Art is about exploring wonder and the unknown, the terra incognita of the soul. Painting is a mirror. It brings up everything, especially fear and yearning. This is where my book The Artist’s Journey comes in to guide you to trusting and believing in yourself as an artist. Now is your time to create the art that lives deep inside of you. If this speaks to you, grab my book and devour it as if your life depends upon it. 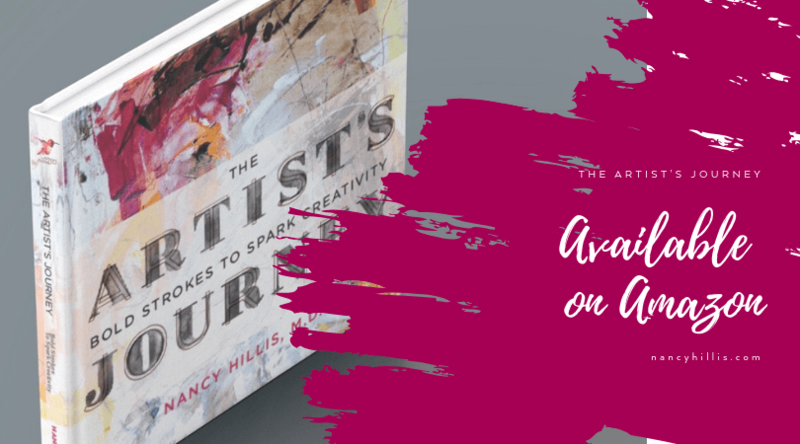 The Artists Journey by Nancy Hillis, MD is an inspirational exhortation with psychological and philosophical underpinnings to move you closer and closer to your deepest self expression in your art and life. Leave your paint stained fingerprints all over this book- your unique prints that exist only once in the universe of time and space. P.S. It’s amazing to hold my book, The Artist’s Journey, in my hands! What a feeling! I poured my heart and soul over the last two years into this book. The Artist’s Journey as an inspirational exhortation with psychological and philosophical underpinnings, to move closer and closer to your deepest self expression in your art and life. Nab your copy on Amazon HERE. Dear Nancy, I can’t wait to dive into your book! Thank you for sharing your incredible insights and deep understanding of what it’s like to be an abstract artist. Knowing that being an abstract artist is my calling and my own unique way of healing the world is indeed a true blessing. Thank you. Thank you for the spark I needed to escape my creative slump! I’ve started reading the book online and journaling in response to the prompts. I’m delighting in the memories that are arising about my early creative impulses (I loved playing in mud!) and I’m now wondering how those impulses might show up in my current artistic explorations. I just ordered my hard copy on Amazon. Thank you for your insights. to day is the day ! ! I grab my brush and my spatula ….I’m not dead yet ah ah ! I ‘ m going to experiment my deepest self expression! Thank you for sharing your incredible insights and deep understanding of what it’s like to be an abstract artist ! Wow! Contemplating my death bed was powerful stuff! I can’t wait to get my hands on the book! Dear Nancy, thank you so much for the inspiration, encouragement and support. I have looked at the chapter headings for your book and feel a strong push towards the embodiment of creativity – you are lighting fires! I am so looking forward to allowing myself to be who I am in the studio bold, raw, wherever it takes me. It’s an adventure of epic proportions!!! Thank you, dear friend, for prompting me to take another deep look at this epic journey I am on. It is time to shake out the cobwebs 🕸 and re-member my purpose. I am looking forward. ten years ago..If not now, WHEN? Instead of painting I was a photographer in a family business selling our work at art shows. I had been putting off a studio and painting because I was so involved with this business. When the economy plummeted that was my wake up call!!! Our business took a downturn. It was time to make my move. Time to enter the art store and purchase long awaited art supplies. Best move I’ve ever made. I have my studio, am a partner in a small gallery and teach collage workshops. So, thank you for your Inspiration and words… I am still going through the bundles . Good Morning Nancy, I downloaded and printed your book and read half in one sitting. Can’t wait to read the rest. The Artist’s Journey is a compelling and exciting read. Your are stoking a fire in this 80 year old artist. The best is yet to come. Thank you from the bottom of my heart. Nancy. I ordered your book as soon as Amazon was taking orders. Waiting waiting waiting. It needs to get here! I loved the online class last year. I love reading everything you write! Cant wait to get it. I know it is fabulous! Evelyn. Thank you for your kind and encouraging words Birgit! Have fun in the studio!!! Thank you for catching that. Bad eyes!!! Will go in and edit. Thank you so much Françoise! How do I find a sample to read of your “todiefor” book? the joy you’ve added to my life. Congratulations on the completion of your book in fulfilling your dream. I am to the final bundle in your Artist Journey online class. The structure of the class is excellent and meticulously thought out in steps to help any level of artist think or rethink the tiny details in each bundle of art being studied. I know your Book will have the same amazing care you give to your students. Now, your audience has the ability to expand. Best Wishes in all you do to assist Artists moving forward. I woke up this morning feeling very depressed, on reading your blog I was Shaken out of my misery. I always turn to your word of possitive teachings, and know that your book will be my bedtime reading. You are certainly the guide I was searching for to forfill my life time dream of becoming an abstract artist. Wow Helen! I’ve got goosebumps reading your note here. The way you described your state of being “shaken out of my misery” is very visual and poetic. I’m so honored to be part of your journey of realizing your dream of becoming an abstract artist. Thank YOU dear Helen. I have preordered my copy of Artist’s Journey and can barely await it’s arrival. I have been inspired by you through your on-line journey . You are instrumental in my jump into self expression through art. Oh Nancy, your book is such a wonderful gift for artists of all types. I so appreciate finding you even as I fall off the wagon at intervals in dealing with the struggle at times. Your words were a balm for my soul and I knew the saying “when the student is ready the teacher will appear” lead me to you. I wish you amazing success with your wonderful book and guide. You’re such a bright light- a true north star. Your radiant spirit brightens my days. Whenever I hear from you, I feel the warmth of your light. Don’t worry about “falling off”. These are the cycles of life, of creation. Your radiant spirit is ever present. Thank you so much for being on this journey with me. You’ve brightened it immensely with your deep kindness. I’m looking forward to getting your book Nancy! I love your writing and your heart behind your art. I sense that your book—your light and creative wisdom—will be the catalyst that I have been needing after two difficult years of my life. Reading this post has lifted my spirits already! I have been feeling older than my years and, in a way, “seeing” my deathbed in shades of gray, with very little light. But your words today have touched me deeply, reminding me of who and what I am. I am very much alive. It is as if you have read my mind. I’m ready to carpe some diem! Thank you. Preordered from Amazon. Excited to get the book. Hope I won’t be disappointed. Thank you Rita. I hope the book is meaningful to you. I can hardly wait to get your book. This has been a hard year for me transitioning into a phase of life and new environment that I am struggling with. Although I have continued painting, I have felt restricted and limited. However, because I shared my dream of creating an art studio in this independent and skilled living residence, one is now in the process of being created. Then I will have room for my easel and larger canvases. In the very first class with you one of my goals was to share this abstract painting experience with other senior and elderly friends. So soon I will have that opportunity and I hope they will be inspired as I have been by this journey with you. Your spirit will be in the room with us. Hi Nancy, I am finally here and very excited to be with you and all your friends and students. I need to catch up and can’t wait to be one of them. Nancy what a wonderful thought process you have given me. I will be 82 this year, I started thinking I might be able to paint if I just took the first step. Soooo I took my first “baby step” in my mid 40s and took a water color class at a community collage. I realized there was a “light at the end of the tunnel” and found acrylic to be the medium of my choice. I continue to take classes and workshops, and much to my delight I am showing in shows and selling my paintings. Why are we so afraid to do what our heart wants to do? I have been married to a wonderful, supportive man for 62 years, so my dreams of being an Artist are being fulfilled! I look forward to reading your book and know it will help me to continue to grow with my dreams. I enjoy reading your messages and look forward to them. Thank you for being here for me. What a lovely note you wrote! Thank you. You inspire me with your determination to say “yes” to your dream of being an artist. The philosopher Camus said something to the effect of: “humans are those that walk around on two legs and worry”. I think fear shows up in various guises when we deeply want to do something, because it means so much to us and we also know that there are perils: perils such as inner and outer criticism, vulnerability, exposure, possible humiliation, disappointment, frustration and so forth. In any case, thank you so much for your lovely message and your support for my writings and the book. Seizing the day here in Scotland, at the same time as ‘licking paint’. The studio makeover continues and aiming to be back in flow of Studio Journey early Feb. I’m missing it! I love painting but detest decorating. Artists – we really are weird and wonderful. We sure are Ruth! I got a big laugh about weird and wonderful!!!! Yes! I’m the same way- I’d rather be painting than decorating. I have had a strong desire to paint my entire life but chose a career in fashion design and interior design. I have worked as a designer for 35 plus years and after reading your inspiring and honest book I feel this is the time to give painting a go! (Even though the thought is terrifying!) I have no fundamentals in painting but I create intuitively in 3-D design. I understand and experience God channeling through me when I do create. My hope is to be able to take your on-line course and become the painter I have always dreamed of being. I read your book in one sitting. It was riveting. It is truly a masterpiece. I think you have discovered the ties and importance of having the capacity to reaching our true selves–unlocking our innermost thoughts and feelings. I have been in therapy on and off since my early 20’s–I am now 61– I have healed from much dysfunction over the years and I am excited to continue on this journey of healing and expressing with you, your workshop and my true self in expressive abstract painting. Thank you from the bottom of my heart for your compelling book and for sharing your knowledge and creativity with so many of us. Love and light to you! Wow! Hand to heart. Thank you so much for your kind and generous endorsement of my writings in the book. I’m deeply moved by what you wrote. 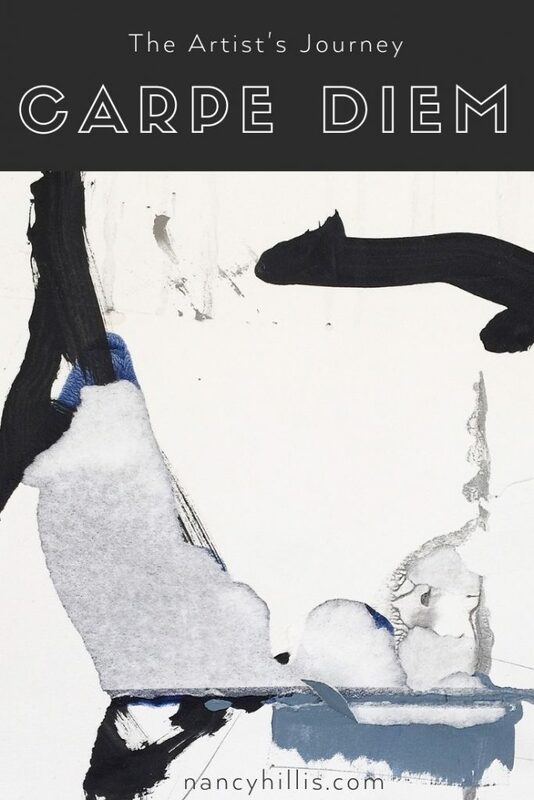 I think it’s wonderful that you’re giving yourself permission to say “yes” to painting, even though it’s terrifying. Thank YOU for being here and for writing to me. My book arrived today and you are speaking my language! I fell in love with it right away and can hardly wait to get started on the exercises! Thank you so much Gaye! I’m delighted to hear this! I’d love to hear about your experience with the book and the exercises.